Guava (Psidium guajava) is a tropical fruit of the Myrtaceae family, native to tropical America. Nowadays, it can be found in the markets of many countries, tropical and subtropical regions, especially in America, India and China, where its consumption is important. The guava tree is called guava, and it is important because its roots, leaves and fruits have medicinal uses in popular culture. Traditionally, the roots are used to treat dysentery, due to its antimicrobial and astringent properties, the leaves are chewed to treat bleeding gums and fight bad breath, and the fruit is a natural remedy for hypertension and diabetes. A tropical fruit full of antioxidants: Such as other tropical fruits, guava fruit is rich in vitamins, being one of the most powerful antioxidant fruits in the world. Guava has three times more vitamin C than oranges and lemons. Guava is one of the richest sources of vitamin C in the world (150 to 400mg. Per 100g. Than fresh fruit), and some varieties are also richer in vitamin A (the pink pulp). 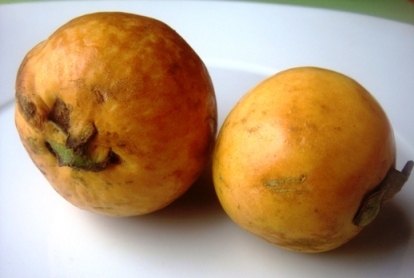 This fruit is rich in pectin, a fiber type with properties to prevent gastrointestinal cancer. It also contains polyphenols, anthocyanins and flavonoids, with antioxidant and heart protective properties. The guava fruit is recommended in a balanced diet, and especially for those people who want to increase antioxidants in their diet, such as athletes, people with nervous states, for smokers, or for cholesterol or anti-aging diets. Guava is considered to be a suitable food to prevent anemia. Because of its high content of vitamin C, guava or guava juice increases the absorption of dietary iron. In this direction, a study introduced guava juice in the diet of children at risk of anemia in Mexico to prevent anemia in this population. Drinking a glass of guava juice during mealtimes helps increase iron absorption. * More information: Diet for anemia. The whole plant is rich in tannins, with astringent effect. Folk remedies use the roots, leaves and fruits against diarrhea, and even today this fruit is still recommended for such purposes. In addition to its astringency, guava and guava leaves are rich in aromatic components, having antispasmodic, sedative effects that helps soothe intestinal cramps. Scientific studies have shown that guava leaves and their extracts have quercetin, a flavonoid with hypoglycemic effect that helps to treat diabetes. Another scientific study also showed that administering natural guava juice for four weeks helped a 25% reduction in blood sugar in diabetic animals. 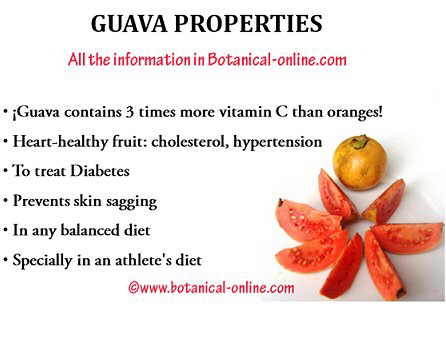 Guava is very healthy to prevent and treat heart disease. Its nutritional composition, balanced in sugar and low in calories, makes it a suitable food for overweight or obese people who want to benefit from its high content of antioxidants. One of its special components of guava is arjunolonic acid, present in very few plants in nature. It is a heart tonic with antioxidant properties, which is used mainly in the Indian Ayurveda to prevent cardiac arrhythmias, coagulation problems, lower blood pressure or control cholesterol levels. Guava has a higher antioxidant content than even citrus. A scientific study showed that participants who consumed guava lowered their “bad” cholesterol (LDL) and increased their levels of “good” cholesterol (HDL) and those who also had high blood pressure got better. Among its components, there is also a plant sterol, (beta-sitosterol), which helps lower cholesterol. For skin: Guava helps improve skin appearance acting from inside the body. This is due to its high content of vitamin C, which stimulates wound healing and rejuvenation of the tissues, because of a direct influence on the production of collagen (protein that gives flexibility and firmness to the skin). This fruit is present in all antiaging diets. Antiseptic: guava leaves are rich in essential oils and plant substances that act as natural antibiotics. Traditionally, the leaves are chewed for bad breath, and an infusion of them is recommended to treat dysentery and for its antiseptic and astringent properties. The bark is rich in ellagic acid, a phenol type which has proved effective against HIV. The leaves are rich in ursolic acid, tannins and quercetin, effective antiviral effective against the AIDS virus. The fruit contains gallic acid and myrcetin, two antiviral components that also fight against HIV. However, this is still a field under study. For fever: Because of its richness in vitamin C, guava and guava leaves is an effective remedy to combat fever. Infusions of guava leaves are recommended as an antipyretic to help reduce fever, improve the body’s immunity and help fight infections..
* Related information: Toxicity of guava.